Decorating for the holidays? If so, you may want to look over some of the tips below to guard against over cluttered decorations. Adding seasonal decorations to your home can increase your home’s clutter if you don’t take steps to remove items in preparation of the decorations. Replace everyday items: When decorating your home make sure you remove everyday items that are being replaced by holiday decorations. It is a good idea to place your everyday items in the boxes that usually hold your decorations. That way you know right where they are and you can easily put them back when removing you decorations after the holidays. Don’t put all the presents under the tree: If you have family or friends that don’t come to visit, you should probably keep their presents in a bag in storage. So when you go to visit them you can simply grab the bag and head out the door to play Santa. Donate or discard unused or broken decorations: Reader John sent us this suggestion last year. If a decoration isn’t being used, then it shouldn’t be stored for another year. Beware of over decorating: Decorating for the holidays can go a bit far. If you go too crazy, then the decorations will lose their appeal and clutter up your space. Sensory overload is not a good thing when it comes to decorating. I would add, don’t decorate early. Right now we have only our Advent candles and wreath on the mantelpiece, and a small porcelain light-up Christmas tree on a desk. We pace ourselves and wait to get our big tree until Christmas Eve. That’s when I bring out the nativity set, as well. This way we don’t get overloaded, and the season is drawn out pleasantly. Since we celebrate Epiphany (January 6th), we like to really decorate just before Christmas and then have the Twelve Days of Christmas. Also, if you don’t have allergies, consider a live (balled) tree in a pot, one that you can plant after the holidays. No storing of a tree, and you add something beautiful to your propery. Since they’re not cut, if you are careful and wait until just before Christmas to bring it indoors, there’s very little needle-shedding. By default, a live tree will be smaller, so you have to adjust your expectations of a big showpiece tree. For our purposes, the tree is mostly for the kids’ benefit, so they decorate it and enjoy it. Argh. Should be “add something beautiful to your property”. I really can type. Our tradition: every time we decorate the tree, everyone participating can choose an ornament or two to permanently remove from the collection. I’ve been doing these things myself to cut down on holiday clutter. But, Matt, where was that photo taken? I’m pretty sure I saw that house many times as a child. 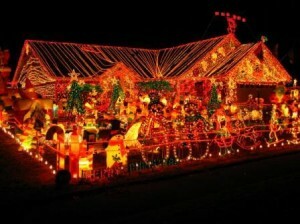 My Dad would take us there to see the crazy decorations because my Mom would never allow such a thing at our house. I recall that the house used to cause traffic jams! We kept our tree simple with plastic balls stored in a huge ziploc with extra hooks at the bottom. Everything in one box. Then I store holiday wreaths on a long pole (hanging from string on either end) in the attic eaves. You could also wrap them in plastic if you’re worried about dust. When you decorate, be sure that you do it in an organized way – make sure all the boxes are labled and ready for the decorations to be returned (I find the boxes made for decorations work best). Will make clean up so much easier! I wrap gifts that will be going out the door in separate, distinctive wrap so it isn’t confused with “our” gifts. For example, all gifts to the in-laws are wrapped in gold foil, all gifts to my folks are in red poinsettia paper, etc. Makes it easy to distinguish when rushing out the door with bags full of wrapped presents. I especially agree with replacing everyday items. I think this is the key to cutting down on clutter. I like to keep all presents under the tree; I consider it to be a decoration in itself. But I also give a small number of presents every year, so presents are unlikely to be a source of clutter in my case. I also love to leave my tree up through January 6, but I still put it up early (first few days of December) because I go away for two weeks later in the month to see family in New England. One new thing I tried this year to keep my tree a bit less cluttered is that I strung a piece of twine in my foyer area, and took about 12 of my favorite ornaments, and put them up there. It looks very sweet and spreads the decoration around the house a bit, but not in an obnoxious way. I can send pictures if anyone wants to see. My tree now looks a little less “crowded” (though I never met a Christmas tree I didn’t like – crowded or not) so each ornament gets its space. I agree with your point about over-decorating! I’ve been to heavily decorated houses that were tasteful, but I’ve also been to heavily decorated houses that were just plain cluttered. I have one big plastic container that I keep my holidays decorations in. If something new doesn’t fit, then something old has to go. I also have one plastic container and anything that doesn’t fit when I’m putting things away is tossed. I have a small tree on my dining room table with my special chrystal ornaments, two small sleighs and a few stuffed Santas. I downsize more each year. This year I only have two wreaths outside. I come from a bit of a different perspective. We are still building our stock of holiday decorations, so we have nothing to get rid of! I have a glass bowl of pine cones on our tv unit, a raindeer covered in birch, the tree with straw ornaments for filler and a few white and silver ornaments. I am trying to add one or two nice ornaments a year to the collection. I am planning to photograph some of the ornaments that have a story but are either broken or not exactly special enough to go on the tree. I never felt I could get rid of the handmade student gift ornaments but I will make a little digital collection instead and declutter the actuals. If I have an ornament I want to toss but can’t bring myself to do it, it gets put at the very bottom of the tree that year. The cats are sure to break it. I took your advice and stored the presents for my out-of-town family and friends–and it made a huge difference! Thanks! Starting with Baby’s First Christmas, each of our children got an ornament of her own and her own little tree in her bedroom each Christmas. By the time they were ready to move out on their own they had a good stash of ornaments to decorate their own trees. @ re Michelle and the cats. We used to do the same with our tornado toddler and gifts we didnt like but couldnt quite bring ourselves to ditch. We left them on the bottom shelf in a cupboard that didnt have locks. If he broke them, oh well! Then if asked where they were, we would just say “Sorry, Jordan broke it”. We also dont put our tree up til at least December 8th, being that the oldest son has his birthday on December 7. I dont think its fair to overshadow his day with Christmas and it keeps Christmas clutter to a 3 or 4 week minimum. I would go one step further and not display the presents under the tree at all. Besides porch pirates outside the houses, the burglary rate increases in my town this time of year. The County Sheriff’s Department sends out this tip every year.